This small table is at the top of the stairs. To the right are two many paned windows which open out (and this winter hold orchids and a begonia) and to the left a pair of many paned French doors that lead to the bedroom space at Linderhof. Below the table is an antique wooden tea chest. Fitting because of my love for tea. Above the table is a mirror. There are many mirrors at Linderhof. 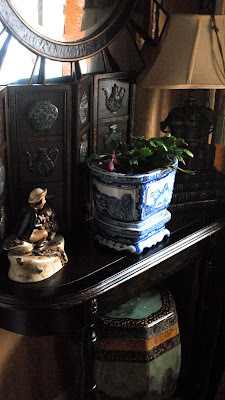 The top of the table holds a small Oriental screen, a lamp (to light the way at night), a plant in a blue and white cachepot (because there always has to be blue and white somewhere) and a Staffordshire figure. Alas, the Staffordshire figure is not real (my pocketbook is not that deep) but I love them and whenever I find one at a reasonable price it comes home with me. I find them mostly in gift shops or decorator shops (since they are new) rather than in antique shops (I rarely find real ones in antique shops on the prairie). Lastly, there has to be blue and white at Linderhof. A cachepot -- not old -- but a bit different holds the wee Christmas cactus that a friend gave me when we built the breakfast room. It's a confused cactus for it bloomed for Christmas and it is now blooming for Easter. The blooms give a bit of color to the hall. It's Tuesday which means that it's time for Tabletop Tuesday with Marty at A Stroll Thru Life. Join her this Tuesday to see what are on other tabletops. I love your tablescape and your house looks very cozy. Your table looks really lovely. I especially like the screen. You Christmas cactus must like where it is at, mine bloomed for X-mas and that is that til next year! You have beautiful table top vignettes, I really like that screen with the tea pots on it! Oh so pretty! It reminds me of the table my grandmother had at the top of her stairs too. Everything looks lovely on your table top at the top of the stairs. What wonderful accessories. Your Christmas/Easter cactus is great. I have one and it didn't bloom at Christmas either. My husband's Granny says you have to "trick" them into blooming by putting them in a cool dark room, but I can never remember to do that. 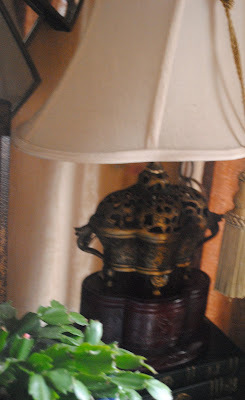 That lamp is just gorgeous. The whole vignette is so pretty. I love your table at the top of the stairs! Your vignette is so nice! I love the little figurine - real or not! :) The lamp is so pretty and that mirror! You've done a great job here. What a pretty little spot. That little screen is darling! Love it! Wow. I'm speechless. All these special pieces come together for perfection. Please post more about that tea chest. I particularly love the mirror - giving me ideas for my glass crafting - and the Staffordshire figure. Love the arrangement too. I like everthing on and under and behind that table. Gorgeous. The table is, as usual, perfectly appointed, Martha. You've made a beautiful home. I love your little table and I adore the Oriental screen. Your confused cactus,is known here as Christmas cactus,we have one and it blooms like mad at Christmas and again at Easter. I do enjoy the photographs of your home,thank you for sharing.